Beautiful locales and ring pulls – Craft-a-licious . .
Karuah is a lovely little place (with a fantastic cafe) that lies on the banks of the oyster-rich Karuah River, just 2-odd hours drive north of Sydney. 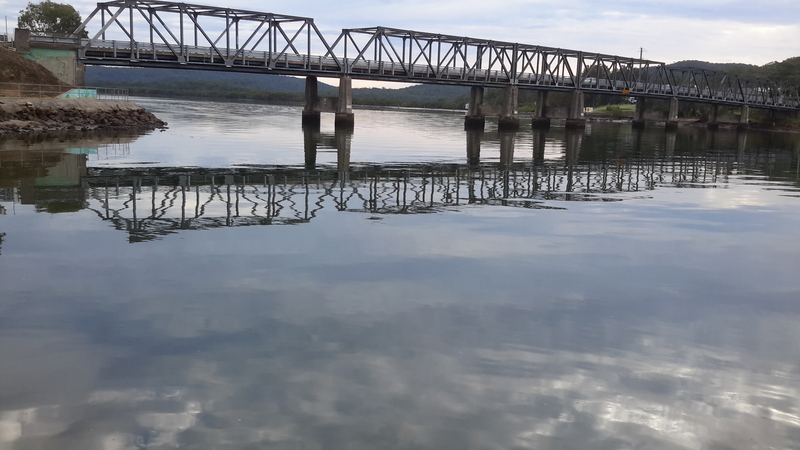 This is a most excellent place to park your caravan and then visit the beaches a short drive away on one side (around Port Stephens) – and the scenic townships, rivers and countryside a little further inland (eg. Maitland, Lorn, Seaham etc). There’s also a great craft market at Nelson Bay every 2nd weekend which is just a stroll away from the craft and art gallery where the volunteers also serve light meals, home made cakes and tea/coffee. Noice, very noice. Karuah bridge … just a stroll from a very nice cafe ..
Before Karuah, we were in Victoria’s high country at a place called Bright. If you’ve never been there – I reckon you definitely need to put it on one of your must visit places. 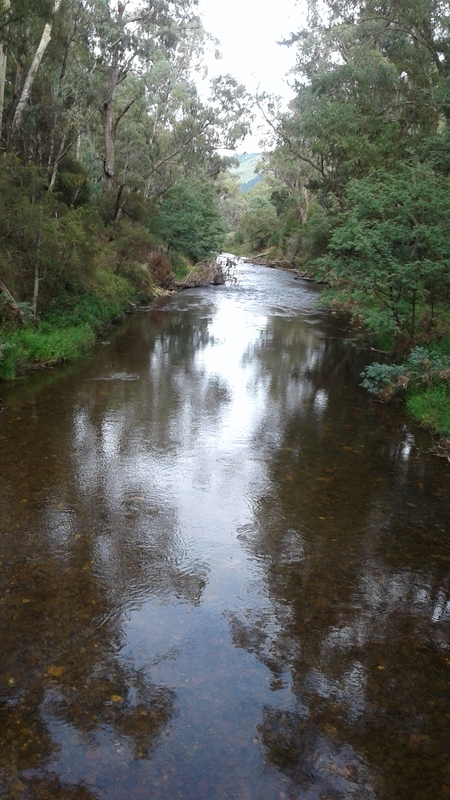 Nestled in a scenic valley by a lovely, quiet river, at the foot of some of Victoria’s best snowfields there’s lots of different walking/hiking/biking activities one can do there at any time of year. The 3 acres of caravan park we stayed in was within walking distance of all things I love – eating and drinking coffee whilst watching others do the exercise – a perfect place to park! Fabulous cafes where you can sit outside with your dog, wander around the clothing and home ware shops, 2nd hand bookshops, opportunity shops and not terribly far from lots of other little pretty, scenic townships. 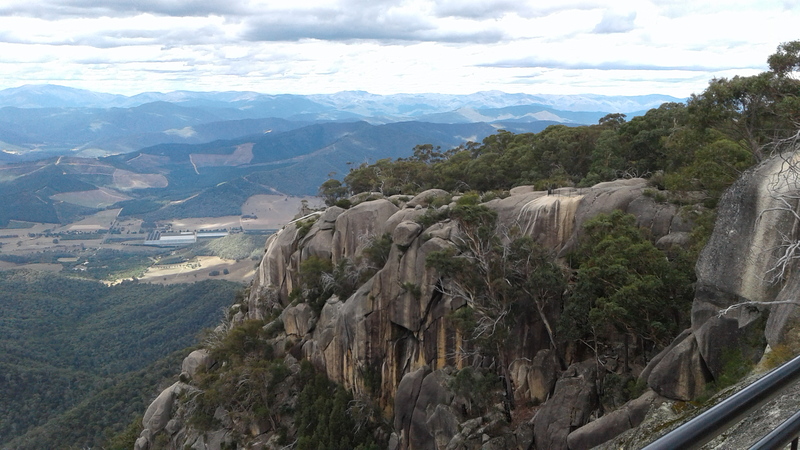 This is an area of Victoria I’d not visited before – but I’ll be coming back. Bright’s pub meals are also well worth the stroll from your caravan as is being awoken to birdsong in the nippy morning air. The home made donuts at Yackandandah bakery (a township not far away) are just too good to forget (damn you thigh-increasing sweet deliciousness!). Oh yes indeedy, I’ll be back. 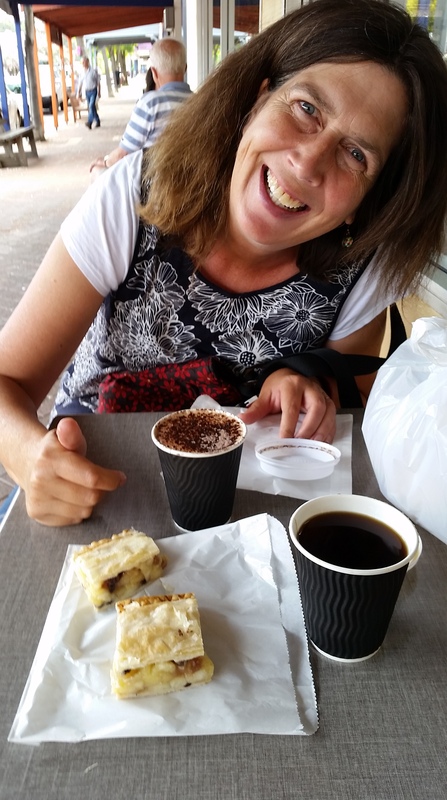 Why I am not skinny – damn you delicious cakes and coffee!! The time spent over summer was wonderful – catching up with friends I’d not seen for 2 years, staying in the green(!) Victorian goldfields [thank you Les and Norma!] (I’ve only known it to be brown over the heat of summer, so this was a surprise), and seeing the many changes in Melbourne and its suburbs was all quite exciting. But I don’t think I could live in a capital city again – there is sooo much traffic. Sipping an espresso beside a pretty bird song-ed water way is more my cup of tea nowadays! ..quite possibly an ‘age’ thing (yuck!). 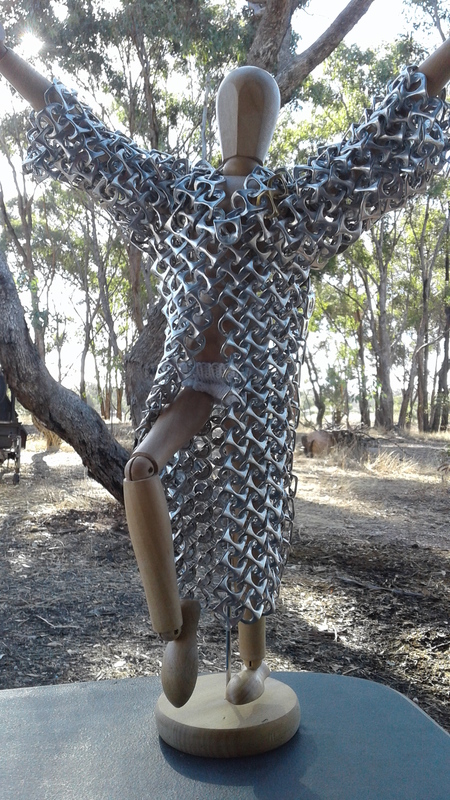 Sitting on an upturned milk crate with a bucket at my side, I de-ring pulled a whole bale of aluminium cans – all 1,057 of them. I’m not sure if the ants gathering around the sugary can spillages and biting my ankles or the blisters on my index fingers from wriggling the ring pulls free hurt more – but it was worth it! These little beauties are versatile to say the least. 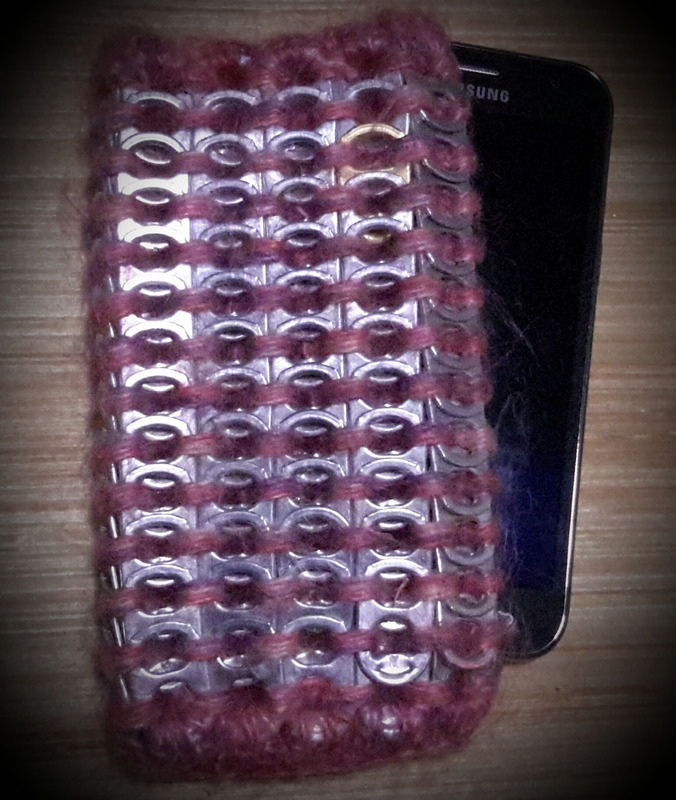 I used Yolanda Soto Lopez’s You-tube videos to crochet these bits together to make a phone cover and a few little coin purses. TIP: As there is a rough side to the resultant ‘fabric’ of crocheting these tabs together – it’s wise to choose a yarn that is a little bulky. When crocheted, the ridge of chain stitches joining the ring pulls (which is on the inside of the fabric) will be higher than the metal ring pull surface, so it doesn’t scratch your phone (.. voice of experience there). 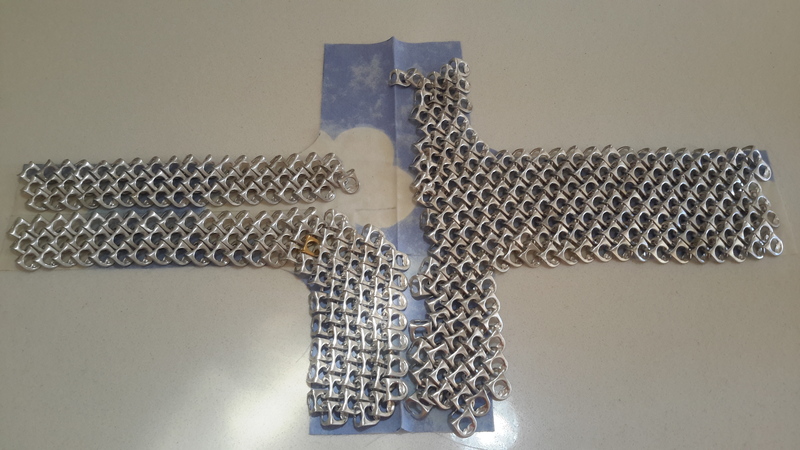 Chain maille can also be made from them – here is a great Instructable on how to do it. I decided to make a kimino-style coat for my 40cm articulated doll using this great technique. This was going great guns until I realised that I’d inadvertently made 2 different types of weaves on the coat, resulting in having to re-do a lot of work. Lesson? Don’t think about the celebratory chocolate cake you intend to make – post kimino completion, just concentrate on the task at hand! Grasshopper pose! .. as much as it’s joints would allow .. also note model is wearing white knitted undies, just a touch risque! I’m currently doing some rather interesting short, wavy knitted rows as well as some knitted wire and feathers – with a twist. I’ve my fingers crossed it will all work out – and shall share these (hopeful!) successes with you next time. Didn’t know where you were. Welcome back to our side of Aus. Yes, we’re still traveling and back on this side of the country now (yay!). 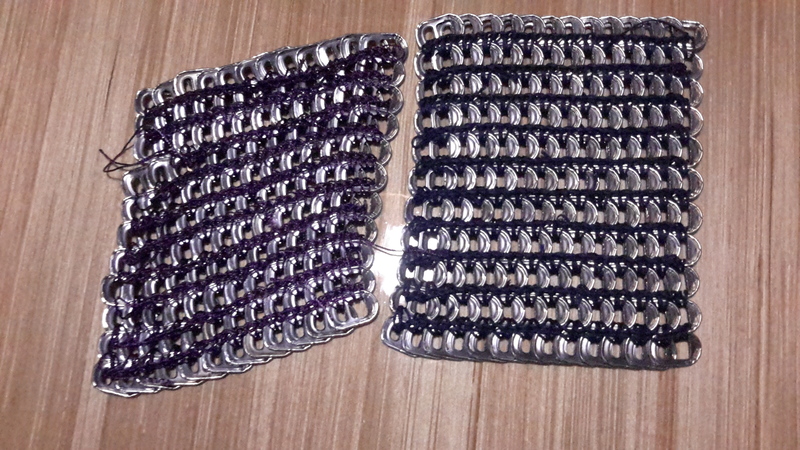 Hi Heather, I do quite like that chain mail – think I may have added to Ralph’s waistline making him drink all those slabs of Coke Zero though … oh well, all for a good cause! I do hope you and Steve are both well, happy and enjoying your van! Hi Heather and Steve – yep, still making our way slowly around the continent! I do hope your both happy and healthy and hope to meet up with you both again! It sounds like you have been having a wonderful time. .. too much eating and talking and not enough crafting Sandy. But you are right – it is lots of fun! Cath you’re so lucky to be visiting Karuah! It’s almost famous! 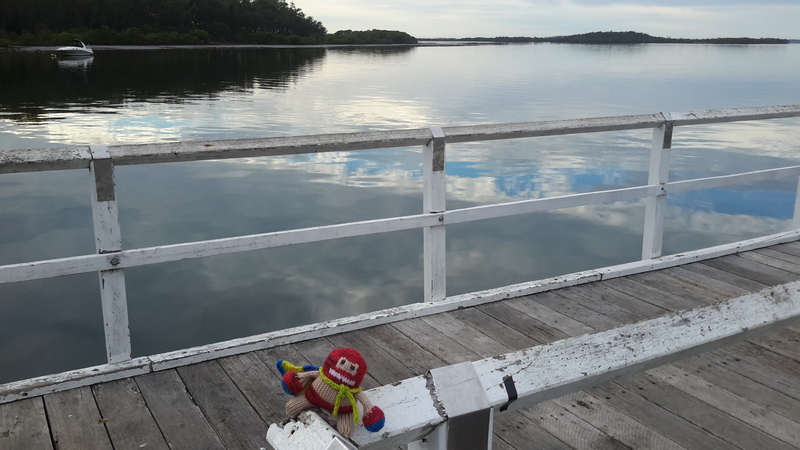 Who’d bother with nearby slick touristy Nelson Bay et al when you can enjoy absolutely pristine views, be a Star in our dramatic small-village soap-opera & eat fat Oysters Kilpatrick every single day of your life? Louise that’s a great idea!, i’d love to see Ralph in ringpull chain mail undies too ( oh baby!). Spoiler alert: Cath is knitting a weirdly mysterious object in her van right now… & she’s locked out all Talkers & won’t even allow in humble Observers in case they ruin her Flow.which they wouldn’t.but she’s being horribly strict about it. Deb, thanks so v much for writing a tome-lengthed comment, only a sister can exhibit that sort of dedication to the ramblings of a sibling. Thank you💖💕. Hi Meryl! A coffee (& cake! ), whilst having a chat and going to a craft group (I haven’t gate crashed) sounds absolutely terrific. However we took the inland route to Hervey Bay (which we’d not done before), and now we’re heading to South Aust. But your offer’s a rain check I’m definitely hanging onto! Thanks so very much for contacting me …I’ll be seeing you!